Great craft beer made by real American heroes. Ten thousand cases arrived in Chicago on Nov. 6 and are currently available at retail stores in Illinois and Indiana. Both big projects and successful businesses take team efforts. Maintaining a top notch craft brewery, for instance, requires the right mix of smart and high-spirited employees who work together — a fair and diligent brewing team, highly skilled brewmasters, by-the-books managers and hard-working boots on the ground that can distribute it all. To find these types of marquee employees, one brewery in particular is looking no further than veterans from America’s armed forces. The Veteran Beer Co. arrived in the beer marketplace on Veterans Day, Nov. 11, with the launch of its first two hand-crafted beers, The Veteran and The Blonde Bomber. The Chicago-based company is veteran owned and all of its employees are veterans who served in every branch of the military. 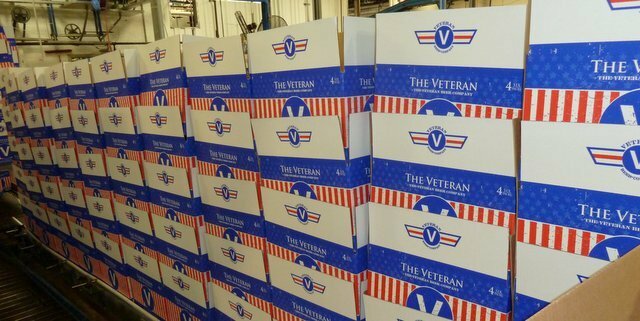 The company’s goal is to hire 100 veterans within its first year, 500 within three years and 3,500 within five years. Both beers are being produced at the company’s brewery in Cold Spring, Minn. Monarch Beverage, based in Indianapolis, will distribute the products in the Indiana beer market place. Mautino Distributing Co. and Flyer Beverage Co. will distribute the beer in the Illinois beer market place. Ten thousand cases arrived in Chicago on Nov. 6 and are currently available at retail stores in Illinois and Indiana including Binny’s Beverage Depot, Kenwood Liquors, Tony’s Finer Foods, and select Safeway stores, Cardinal Liquors, Nardi’s on Chicago, and The Department. They are also available in Chicago at Hooters, The Lodge, Bootleggers, Mother’s Too, Pippin’s Tavern and Streeter’s Tavern. Both beers will also be available at all Levy Restaurants located inside the United Center in Chicago. The company’s brewmaster Eric Rine began his career as an aviation supply officer before transitioning to fighter aviation as an F/A-18D Weapon Systems Officer. Chasing Craft liked this on Facebook.